Fullname: Carl Fleming Edwards Jr. Draft: 2011, Texas Rangers, 48th rd. Carl has spent the last two full seasons on the major league roster, recording 48 holds and posting a 2.81 ERA (37 ER/118.1 IP) in 131 relief outings ... has limited opponents to a .160 average in that span, the third-best mark among N.L. relievers ... Since making his major league debut with Chicago in September of 2015, has posted a 3.06 ERA (54 ER/159.0 IP) while going 8-7 with two saves and 54 holds in 172 career games ... has struck out 217 and walked 87 ... Acquired from Texas, July 22, 2013, with infielder Mike Olt and pitchers Justin Grimm and Neil Ramirez for pitcher Matt Garza ... originally selected by Texas in the 48th round of the 2011 draft ... Has gone 20-12 with a 2.25 ERA (80 ER/319.2 IP), seven saves and a complete game in 113 career minor league outings, including 49 starts ... transitioned from a starter to a reliever in 2015 ... Named the Cubs fifth-best prospect heading into the 2015 season by Baseball America ... the publication ranked him as the franchise's third-best prospect prior to the 2014 campaign ... Participated in the Cubs Rookie Development program in January of 2014 and the Cubs Caravan in 2015 ... Named a 2013 mid-season South Atlantic League All-Star with Single-A Hickory ... Baseball America named him to the Minor League All-Star team following the season ... Graduated from Mid-Carolina High School in Prosperity, S.C ... Was one of only four active MLB players drafted and signed in the 48th round or later to appear in a MLB game in 2018 (also Efren Navarro, Vidal Nuño and Jarrod Dyson) ... he is the first to play for the Cubs after being drafted and signed in the 48th round or later since Justin Speier in 1998 (55th round, 1995) ... Is the fifth true Cubs pitcher to wear a single-digit uniform number (also, Tony Jacobs in 1948; Walt Lanfranconi, Wimpy Quinn and Johnny Schmitz in 1941) ... his uniform number is the lowest to be worn by a true Cubs pitcher since Jacobs sported number two. Carl posted a career-best 2.60 ERA (15 ER/52.0 IP) in 58 relief outings ... held the opponent scoreless in 46 of 58 games ... Placed on disabled list, May 30, with right shoulder inflammation ... activated, July 6, after a rehab assignment with Iowa (3 G, 2.0 IP, 2 R) ... Did not allow a run in a career-high 15.0-straight innings, April 5-May 8 ... allowed just five hits and six walks, while fanning 27 batters, in 14 relief outings during that span ... Pitched a career-high tying 2.0 innings, July 25 vs. Arizona (0 H, 0 R, 2 SO) ... earned the win in the Cubs' 2-1 victory ... Ranked 11th among N.L. relievers with 11.60 strikeouts/nine innings ... Surrendered 19 walks in his final 26 outings (8.41 BB/9 IP) ... had allowed just 13 walks in his first 32 games (3.69 BB/9 IP) ... Allowed seven earned runs in a three game span (2.0 IP), May 12-16 ... his ERA in his other 55 outings was 1.44 (8 ER/50.0 IP) ... Limited opponents to a .190 average, including a .155 average (17-for-110) and a .534 OPS by righties. Carl spent his first full season in the majors, and was one of the most dominant relievers in the National League ... led N.L. relievers with a .134 batting average against while his 12.75 strikeouts per 9.0 innings ranked seventh ... his 25 holds were tied for fifth-most by a Cubs reliever in a single season... All told, was 5-4 with a 2.98 ERA (22 ER/66.1 IP) in 73 relief appearances ... walked 38, struck out 94, allowed six homers and recorded a 1.01 WHIP... Led all major league relievers with just 3.93 hits allowed per 9.0 innings ... marked the best single-season mark for a Cubs reliever in franchise history, surpassing Carlos Marmol's 4.12 hits allowed per 9.0 IP in 2008... Limited opponents to a .503 OPS, fourth-lowest among all N.L. relievers. © Held the opponent scoreless in 62 of 73 outings ... struck out at least one batter in 58 of 73 appearances... Left-handed hitters batted .119 (13-for-109), the second-lowest mark for a right-handed reliever against left-handed batters ... Houston's Chris Devenski held left-handed batters to a .111 average (16-for-144)... Pitched to a 0.79 ERA (2 ER/22.2 IP) in his first 25 games through June 7 ... held opponents to a .085 average (6-for-71) and .376 OPS in that span... Starting June 9, posted a 6.95 ERA (17 ER/22.0 IP) in 24 outings through August 6, as he walked 19 and struck out 33 ... rebounded by posting a 1.25 ERA (3 ER/21.2 IP) in his final 24 outings, issuing just eight walks compared to 30 strikeouts... Earned his first-career win, April 21 at Cincinnati ... tossed a scoreless 10th inning in the Cubs' 6-5, 11-inning triumph... Twice pitched a season-high 2.0 innings: April 13 vs. the Dodgers and May 2 vs. the Phillies... Began the season with 12 scoreless outings (12.0 IP) through May 2 ... contributed to a career-high 13.0-inning scoreless streak dating to 2016... Finished the season with 9.2 scoreless innings spanning 11 outings, September 10-30 ... opponents batted .067 (2-for-30) ... did not allow a hit in his final 10 games (8.2 IP)... Appeared in seven postseason games, pitching at least 1.0-scoreless inning in four of those outings ... however he allowed six earned runs in a combined 0.1 innings in his other three outings. Carl made 36 relief appearances for Chicago, posting a 3.75 ERA (15 ER/36.0 IP) with a 0.81 WHIP and a .123 opposing batting average ... Led N.L. pitchers (min. 30.0 IP) in swing-and-miss percentage (39.5 percent), opposing average (.123) and H/9.0 IP (3.75) ... led N.L. rookies (min. 30.0 IP) in soft-hit percentage (25.0 percent), opposing OBP (.210), opposing OPS (.456), WHIP (0.81) and strikeout percentage (37.7 percent) ... Had a 1.45 ERA (3 ER/18.2 IP) in 18 games on the road, limiting opposing batters to an .051 batting average (3-for-59), by far the best opposing average on the road in the majors (min. 15.0 IP) ... next-lowest was teammate Pedro Strop (.120) ... Limited batters to a .054 clip (5-for-92) with two strikes ... opposing hitters batted .114 (4-for-35) with runners in scoring position ... Appeared in eight postseason games, the most by any rookie pitcher in the 2016 playoffs ... went 0-1 with a 2.84 ERA (2 ER/6.1 IP) while striking out four batters ... recorded the first two outs in the last inning of Game Seven of the World Series ... Did not allow a hit in 25 of his 36 outings ... 28 of his appearances were scoreless ... Fanned a career-high five batters, July 31 vs. Seattle, tossing 2.0-scoreless innings in the Cubs 7-6, come-from-behind victory ... Recorded his first-career save, September 1 vs. San Francisco, tossing a perfect ninth inning ... also earned a save in the Cubs season finale, October 2 at Cincinnati ... Combined to go 0-1 with a 2.84 ERA (2 ER/6.1 IP) in eight post-season relief appearances ... made two scoreless appearances (2.0 IP) in the NLDS vs. San Francisco and three scoreless outings (1.2 IP) in the NLCS vs. the Dodgers ... Pitched in 24 games at Triple-A Iowa, going 1-1 with a save and a 4.26 ERA (12 ER/25.1 IP) ... was recalled, May 11, as the 26th man for the Cubs twin-bill against San Diego ... was recalled again, June 20, and spent the rest of the season with Chicago. 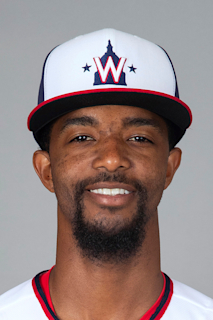 Carl Edwards Jr. made his major league debut, posting a 3.86 ERA (2 ER/4.2 IP) in five relief appearances after being recalled, September 7 ... split time between Double-A Tennessee and Triple-A Iowa, going a combined 5-3 with a 2.77 ERA (17 ER/55.1 IP) in 36 relief appearances. Named to the All-Star Futures game, representing the U.S. team. Made his major league debut, September 7 at St. Louis ... tossed a scoreless inning of relief in the Cubs 9-0 victory. Began the year at Tennessee, going 2-2 with four saves and a 2.66 ERA (7 ER/23.2 IP) in 13 relief outings ... struck out 36 batters. Was promoted to Iowa, May 29, and made 23 relief appearances with the I-Cubs, going 3-1 with two saves and a 2.84 ERA (10 ER/31.2 IP). Was placed on the minor league disabled list, August 18, with a blister ... activated, September 3. C.J. combined for a 2.35 ERA (14 ER/53.2 IP) in 10 starts with Double-A Tennessee and two rehab starts with Rookie League Mesa, as he was on the minor league disabled list, April 25-August 2, with a right shoulder strain...Held batters to a .173 average (32-for-185) and a .272 on-base percentage...Struck out 54 hitters and walked 25...Allowed just nine extra-base hits including one home run...Opened the campaign with Tennessee and was 1-0 with a 2.61 ERA (6 ER/20.2 IP) in four starts before landing on the disabled list...Made two rehab starts with Rookie League Mesa, July 23-28, and posted a 1.59 ERA (1 ER/5.2 IP)...Pitched to a 2.30 ERA (7 ER/27.1 IP) and held the opponent to a .174 batting average (16-for-92) in six August starts after his time on the shelf...Named an Arizona Fall League All-Star after going 1-0 with a 1.80 ERA (3 ER/15.0 IP) in six starts for the Mesa Solar Sox. Combined to go 8-2 with a 1.86 ERA (24 ER/116.1 IP) in 24 starts between Single-A Hickory in the Rangers organization and Single-A Daytona ... acquired by Chicago in a five-player deal with Texas, July 22 ... Combined to strikeout 155 batters in 116.1 innings, good for an average of 12.0 strikeouts per 9.0 innings ... walked just 41 ... Allowed one or no earned runs in 19 of his 24 starts ... In six starts with Daytona following the trade, had no record with a 1.96 ERA (5 ER/23.0 IP) ... walked seven and struck out 33 ... Named a South Atlantic League mid-season All-Star with Hickory, and was 8-2 with a 1.83 ERA (19 ER/93.1 IP) in 18 starts prior to the trade. In his first pro season, was 5-3 with a 1.48 ERA (11 ER/67.0 IP) in 14 games (13 starts) between the Rookie League Rangers and Single-A Spokane ... Struck out 85 hitters in 67.0 innings for an average of 11.4 strikeouts per 9.0 innings ... walked 25 and did not surrender a home run ... Began his pro career with 20.0 scoreless innings spanning four games (three starts) with the Rookie League Rangers ... struck out 25 and walked six ... Joined Spokane, July 12, and went on to go 2-3 with a 2.11 ERA (11 ER/47.0 IP) in 10 starts ... Named the Rangers Minor League Pitcher of the Month for July, going 1-0 with a 0.76 ERA (2 ER/23.2 IP) in five games between the Rangers and Spokane. April 24, 2019 Carl Edwards Jr. roster status changed by Iowa Cubs. April 24, 2019 Iowa Cubs activated RHP Carl Edwards Jr. from the 7-day injured list. April 17, 2019 Iowa Cubs placed RHP Carl Edwards Jr. on the 7-day injured list retroactive to April 15, 2019. April 6, 2019 Chicago Cubs optioned RHP Carl Edwards Jr. to Iowa Cubs. July 16, 2018 Chicago Cubs activated RHP Carl Edwards Jr. from the paternity list. July 14, 2018 Chicago Cubs placed RHP Carl Edwards Jr. on the paternity list. July 6, 2018 Chicago Cubs activated RHP Carl Edwards Jr. from the 10-day disabled list. June 29, 2018 Chicago Cubs sent RHP Carl Edwards Jr. on a rehab assignment to Iowa Cubs. May 30, 2018 Chicago Cubs placed RHP Carl Edwards Jr. on the 10-day disabled list. Right shoulder inflammation. April 17, 2017 Chicago Cubs activated RHP Carl Edwards Jr. from the bereavement list. April 14, 2017 Chicago Cubs placed RHP Carl Edwards Jr. on the bereavement list. June 20, 2016 Chicago Cubs recalled RHP Carl Edwards Jr. from Iowa Cubs. May 12, 2016 Chicago Cubs optioned RHP Carl Edwards Jr. to Iowa Cubs. May 11, 2016 Chicago Cubs recalled Carl Edwards Jr. from Iowa Cubs. March 18, 2016 Chicago Cubs optioned RHP Carl Edwards Jr. to Iowa Cubs. October 22, 2015 Carl Edwards Jr. roster status changed by Chicago Cubs. October 7, 2015 Chicago Cubs reassigned RHP Carl Edwards Jr. to the minor leagues. September 7, 2015 Chicago Cubs recalled RHP Carl Edwards Jr. from Iowa Cubs. September 3, 2015 Iowa Cubs activated RHP Carl Edwards Jr. from the 7-day disabled list. August 18, 2015 Iowa Cubs placed RHP Carl Edwards Jr. on the 7-day disabled list. July 16, 2015 Iowa Cubs activated RHP Carl Edwards Jr. from the temporarily inactive list. July 11, 2015 Iowa Cubs placed RHP Carl Edwards Jr. on the temporarily inactive list. May 29, 2015 RHP Carl Edwards Jr. assigned to Iowa Cubs from Tennessee Smokies. April 6, 2015 RHP Carl Edwards Jr. assigned to Tennessee Smokies from Iowa Cubs. March 19, 2015 Chicago Cubs optioned RHP C.J. Edwards to Iowa Cubs. November 20, 2014 Chicago Cubs selected the contract of Carl Edwards Jr. from Tennessee Smokies. August 2, 2014 Tennessee Smokies activated RHP C.J. Edwards from the 7-day disabled list. July 23, 2014 Tennessee Smokies sent RHP C.J. Edwards on a rehab assignment to AZL Cubs. April 30, 2014 Tennessee Smokies placed RHP C.J. Edwards on the 7-day disabled list retroactive to April 25, 2014. March 25, 2014 RHP C.J. Edwards assigned to Chicago Cubs. July 23, 2013 RHP C.J. Edwards assigned to Daytona Cubs. July 22, 2013 Chicago Cubs traded RHP Matt Garza to Texas Rangers for RHP C.J. Edwards, RHP Justin Grimm, 1B Mike Olt and Player To Be Named Later. June 7, 2013 Hickory Crawdads activated RHP C.J. Edwards from the 7-day disabled list. June 2, 2013 Hickory Crawdads placed RHP C.J. Edwards on the 7-day disabled list. April 3, 2013 RHP C.J. Edwards assigned to Hickory Crawdads from Spokane Indians. July 10, 2012 C.J. Edwards assigned to Spokane Indians from AZL Rangers. June 20, 2012 C.J. Edwards assigned to AZL Rangers. August 15, 2011 Texas Rangers signed RHP C.J. Edwards.